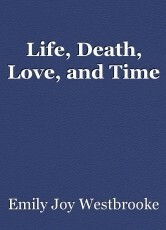 4 beings control the 4 major drives of existence: Life, Time, Cupid, and Grim Reaper. Life doesn't give any thought to any of the others. Time is quite punctual and OCD and does not wait. Cupid is a warrior, protector, miracle worker, and everything in between. Grim Reaper is just, injust, fair, unfair, beautiful, dangerous, painful, and different. What is it to be immortal. This page was created in 0.3548 seconds.